Root beer floats? Classic bacon-y burgers? Mascots?! You might as well spell America “A&W” because this outpost to patriotic eats is the oldest restaurant franchise in America. And in honor of root beer float season… er, summer, we hit them up for more than a dozen things you probably didn’t know about (hint: spaghetti is involved). The story goes that in 1963, long-time Michigan franchise owner Dale Mulder took cues from his repeat customers always requesting slabs of bacon on top of their cheeseburgers and put the thing on his restaurant’s menu. 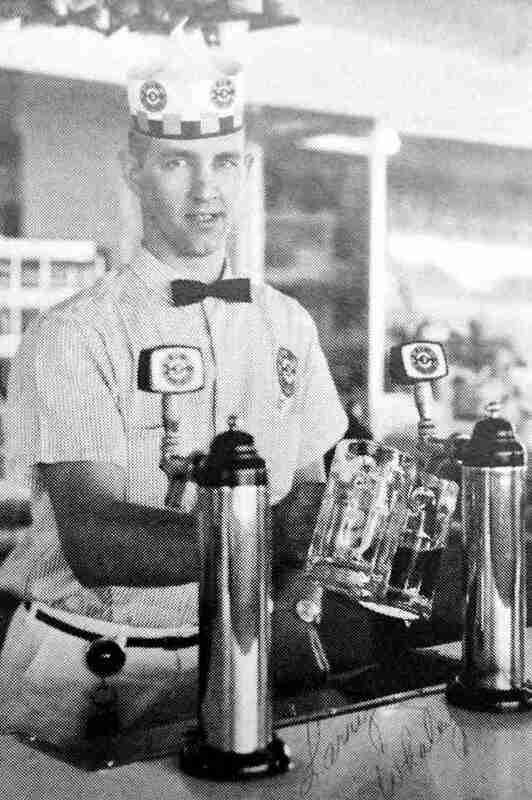 And before you scoff that “that can’t possibly be true,” check this: not only did several regional journalists investigate and corroborate the claim in the ‘60s, but when A&W launched an ad campaign in 2014 boasting about it, no one came forward to contest. 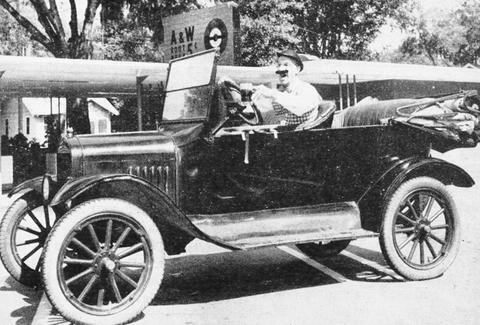 The very first A&W root beer was served during a homecoming parade for WWI vets, which is pretty damn patriotic. 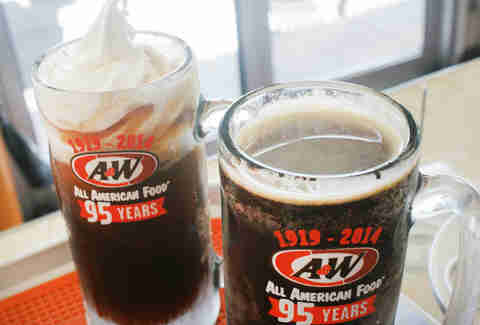 Speaking of vets, A&W tip their mugs to Wounded Warrior Project every year during the invented-because-they’re-obsessed-with-floats holiday: National Root Beer Float Day on August 6th. Donations to the veterans’ charity are encouraged, and each patron gets a free small float. Impressive fact: the company started in 1919. Even more impressive fact: it only took them two years to figure out that franchises mean restaurants with owners who care a ton about their establishment. They became the first franchised restaurant company in 1921, and by their peak in the ‘70s had even more stores than McDonalds. 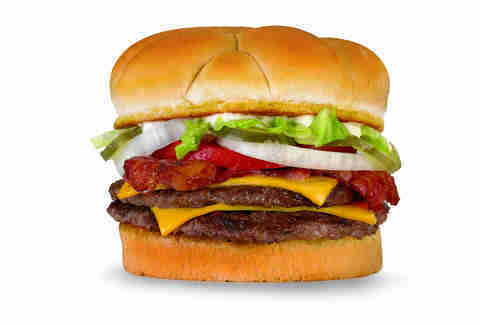 Hamburgle that. The Golden state is so synonymous with driving that we almost forget a time when it wasn’t a destination for cars. 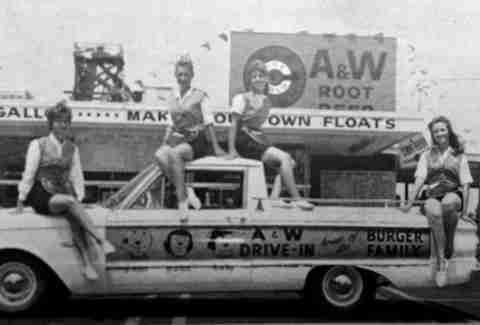 But A&W lays claim to the first ever Cali drive-in, which opened in Sacramento in 1923. 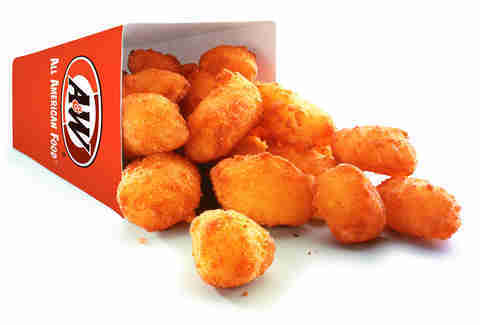 Because there are franchises freakin’ everywhere, A&W estimates that there are roughly 35,000 menu variations across their restaurants, including those cheese curds up there, pork tenderloin sandwiches in the Midwest, burritos in California, and, yes, spaghetti at select franchises. A&W franchises have such lasting power that around 30 of them are currently run by second- or third-generation owners, including franchises in Wisconsin, Iowa, Ohio, and more. Which poses the inevitable question, who’s gonna petition for A&W & Sons first? Most A&Ws use a fancy, paddle-stirred brewing kettle to whip up their own root beer in-house, every single day. The thing is so refined it only takes an hour to brew. 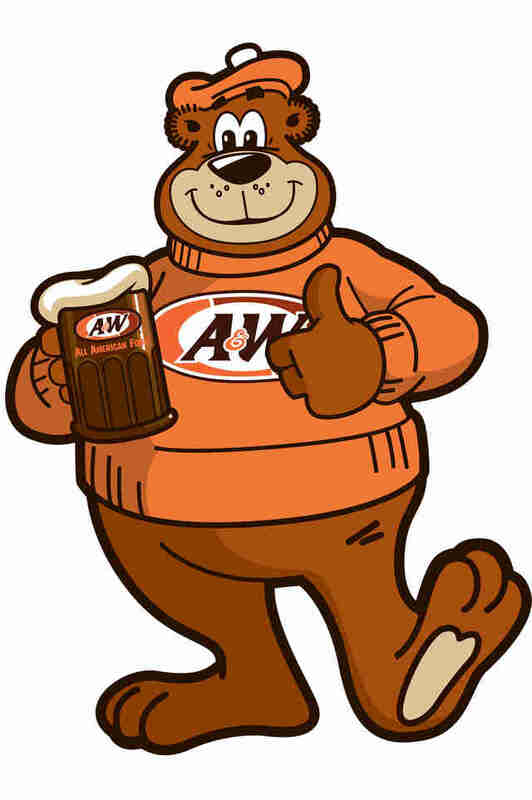 A&W’s mascot, Rooty the Great Root Bear™, appeared in 1974 but was sent into hibernation in the 2000s. 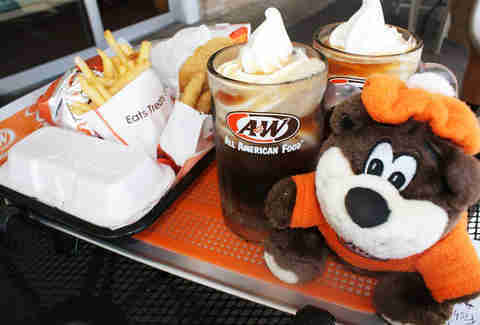 Recently, A&W brought him back and stuck him in charge of their Twitter account. But Rooty’s tough breaks didn’t end there: He was kicked off LinkedIn for inexplicable reasons (okay, fine, it was because he’s a mascot bear, not a human professional). In the early ‘80s, A&W launched a third-pound burger and an accompanying “third’s the word” ad campaign to rival Micky D’s ubiquitous quarter pounder. While taste tests yielded positive results, consumers didn’t go for the bigger patty. Why? Well in a Times article, aptly titled, “Why Do Americans Stink At Math?” it was determined by focus group that most readers didn’t understand that the third-pounder was actually bigger than the quarter pounder. (Because: math… hard) Face, meet desk. A&W is known for their collector mugs, and throughout the 2000s wooed collectors by randomly selling secret special-edition mugs. They’ll design a new one most years, and throw in one-of-a-kind editions on occasion -- making the mascot pictured on the mug hold up a peace sign instead of a waving hand, for example. For one of their mugs, they even got the rights to a super-rare ‘60s Mountain Dew logo. You can’t drink out of a stamp, can you? In 1999, Lodi, CA franchisee Pete Knight took it upon himself to make float history --no, not the amount of time in a pool lounger… like root beer floats. He scored the Guinness World Record for largest vat of ice cream soda deliciousness by flooding it with 2,562.5 gallons of root beer and plopping in 400 gallons of ice cream.